- Antique Master Print, titled: 'Grande Chasse a l'Oiseau.' - (The great falconry hunt.) Lively hunting scene with figures on foot and horseback, hunting birds with falcons. Etching/engraving on hand laid (verge) paper. 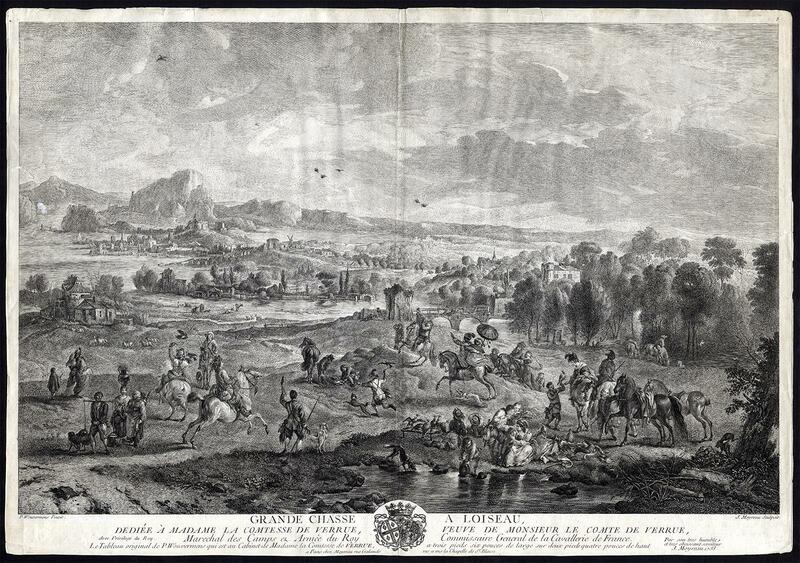 Description: Published by Moyreau in 1733 Artists and Engravers: Made by 'J. Moyreau' after 'P. Wouwermans'. Jean Moyreau (French, 1690-1762) eas a French engraver, student of Bon and Boullogne. He became a member of the Academy in 1736 and exposed at the Salon from 1737-1761. Philips Wouwerman (1619-1668) was a Dutch painter of landscapes, hunting and battle scenes. Condition: Good, given age. Creases and small nicks in the margins/plate edges. A small tear from the left edge a little into the image (with old restoration). A middle fold. Some discolouration around the middle fold. General age-related toning and/or occasional minor defects from handling. Please study scan carefully. Storage location: TPC-P3-15 The overall size is ca. 26.4 x 18.3 inch. The image size is ca. 25.6 x 16.3 inch. The overall size is ca. 67 x 46.5 cm. The image size is ca. 65 x 41.5 cm.